1.) What is Zombie Pirates?? 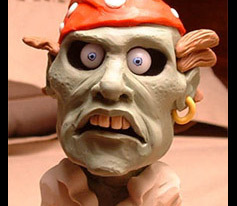 Zombie Pirates is a stop motion animated film idea about life on the sea. And of course Zombie Pirates and what kind of trouble they get into. The story idea is basic. Captain Quill is in charge of stealing the loot back from the Zombie Pirates by order of the king. The captains crew is made up of people who have no knowledge of the sea, or that their enemy can't be stopped by traditional guns and swords. The ones that do have this understanding are generally not too smart, which leads to a lot of crazy situations. I'm making the film through donations currently, and the only other person involved at the moment is David Bennett - who is doing the voices for the characters. I plan to have some nice orchestral music when the film is completed, which will either be from CD libraries or a real orchestra. 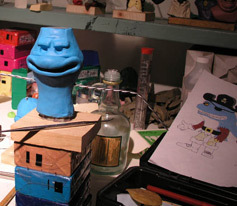 Once the first film is done I should have enough molds and set work done to make the next group of cartoons much faster then things are going now. The original plan was to make one cartoon every 2 months or so, which might be possible after I get more characters made. For now I'm only making a few puppets for the first cartoon. 2.) Who are the creators? Staff on this project?? Just my determined self and David Bennett who recorded the voices for the first cartoon. Stop motion is a really magical thing to watch, and it's something I strive to get good at. In a way the first Zombie Pirates cartoon is a real test for me, to see how well I can make a film this large "several minutes" by myself. Plus I'd like to use this film as a stepping stone to bigger things. I always wanted to work in a studio doing what I am doing now. Since I have a fairly large garage to make the films in I'm making the best of it. 4.) Will it be just one movie? or a Series of movies? Right now it's just one cartoon, but I already have several small stories laid out for the next episodes of Zombie Pirates. 5.) Main cast of characters?? The two main captains are Captain Quill "the good guy" who is trying to outsmart Captain Lock Jaw "half shark half zombie". And each of them has a crew. After each film I will introduce more crew members to tell the stories. But for now Ruble the Russian will be the star of the first cartoon. You will see a monk with no role in the first cartoon, and a special character that I can't give away just yet. 6.) Some advice/tips for people who want to get into making movies like yours? 7.) When will the movie(s) be done!?! I don't have a date that I'm shooting for right now, but I hope to have this first one done in a few more months. It depends on how much time I have to work on it. 8.) How can your fans help? Thanks for asking, really just showing your support and encouragement in the message board area is helpful. Of course when a need arises such as making a puppet from foam latex - I occasionally need donations to pay for the materials. So money is what is most needed to get the materials to make the puppets and sets. All donators get their name in the credits as a way to thank them for the help. 9.) Where did you learn how to make such detailed characters? I'm partly self taught, and I also have studied on the web - and through work experience ways to make puppets. Webster Colcord "a fellow Zombie fan" also helped me learn a lot over the years. You can see some of his really cool work at www.webstercolcord.com. 10.) Anything else you'd like to add? Just that your site looks great, I'll be adding a link to your site from mine soon. For anyone who is a Claymation fan, and loves zombies, keep checking back to zombie pirates to see when the movie(s) are finished! I'm looking forward to it! An awesome zombie made out of clay! 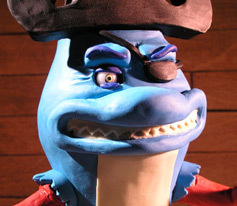 Looks like a shark pirate. Very well detailed, cant wait to this guy in action! 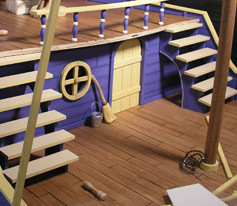 A really nice set, this is the one of the ships on the deck. On their site, you can see the process of the boat being made. A sketch of the shark and the making of the shark.